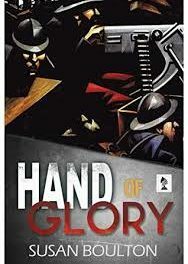 From times gone by, a hand of glory was used by thieves to discover lost treasure, the stuff of dreams yet here Captain Giles is sent back home after the Great War to recover from his ordeal on the battlefield and get a sense of peace back into his life. Captain Giles has the best of intentions to finally settle down, but his journey home only sees him wallowing in the grief of what horrors he has witnessed in war, and with the help of new friend Agnes Reed and the ghost of Corporal George Adams he intends to get his life back. True to legend the hand of glory or maine de gloire can open doors for thieves without the intervention of the local authorities. Susan takes us through Captain Giles’s life in the trenches where he watched his friends die, to his stay in hospital through to his subsequent recovery. His astonishment at seeing Corporal Adams back as a spectre of his former self is very endearing and thought-provoking. Giles hears about Archie, a former serviceman from the war has a hand of glory he plans to enchant and use to get what he wants from those who are grieved by their loss while Giles decides to find Archie and destroy the hand, helping the dead of Flanders find eternal rest. The story is full of slang, swearing and dark situations which show how power can get in the wrong hands and have the potential to cause havoc. Susan Boulton has included a glossary of British slang for those of us who do not automatically understand the slang of the turn of the century. Her first novel was Oracle and a steampunk influenced title that made her popular enough to continue her work on several short stories: Jac, The Giving of Adela and Death Won’t Be Cheated. 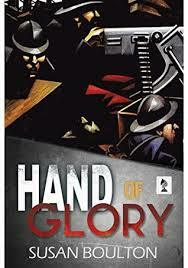 Hand of Glory was inspired by Susan’s interest in World War l and an interest in folklore and myth of the time.